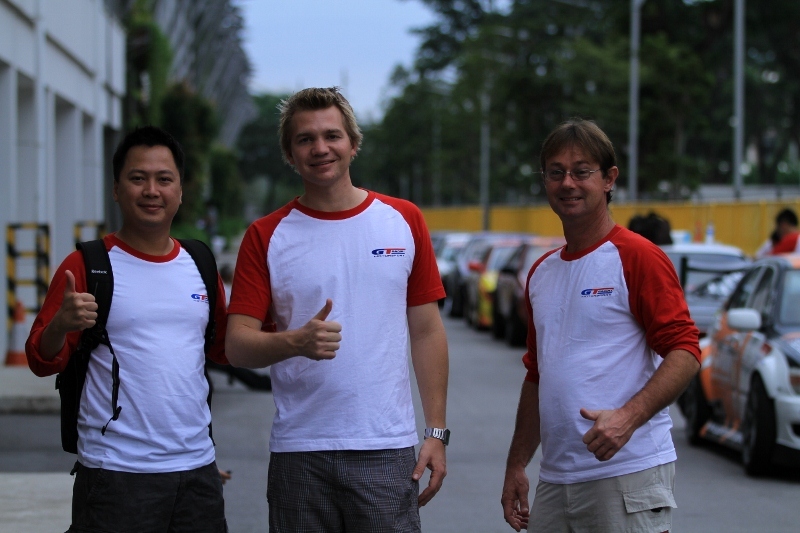 My good friend Leo (on the left) from GT Tires Indonesia recently sent me a CD full of photos taken in and around the F1 pit area during Formula D Singapore. After looking through them all, I thought I’d share a few of the shots from behind the scenes! The stuff that you don’t usually get to see as a spectator at these sort of events. One of the first things we did was get the car scrutineered. We were 2nd in line, as we wanted to make sure we had time to sort out anything that wasn’t right. After a few little tweaks we were good to go! Thanks again to Gavin Wood and his team, and all that helped get the car and I ready for the trip. 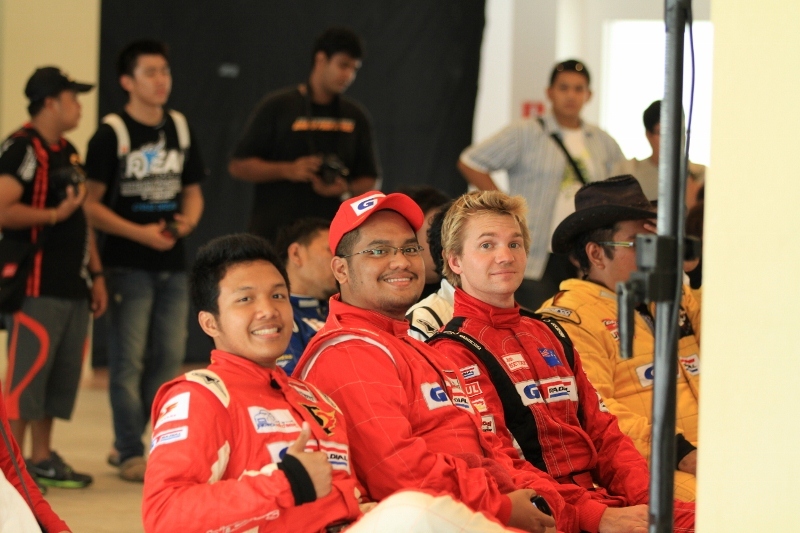 Being the first time some of my young team mates and I had been involved in an event of this calibre, we were really enjoying the level of excitement, the media attention and the atmosphere amongst the drivers and officials. We had a few meetings throughout the event, and as I explained in an earlier update, the officials wanted all drivers there on time, or there were penalty’s. I think this is great, as everyone knows where they stand, and there can’t be any confusion later on if everyone is at the meeting and knows the drill. After the first meeting on Friday afternoon, all the media wanted a group photo of the drivers. 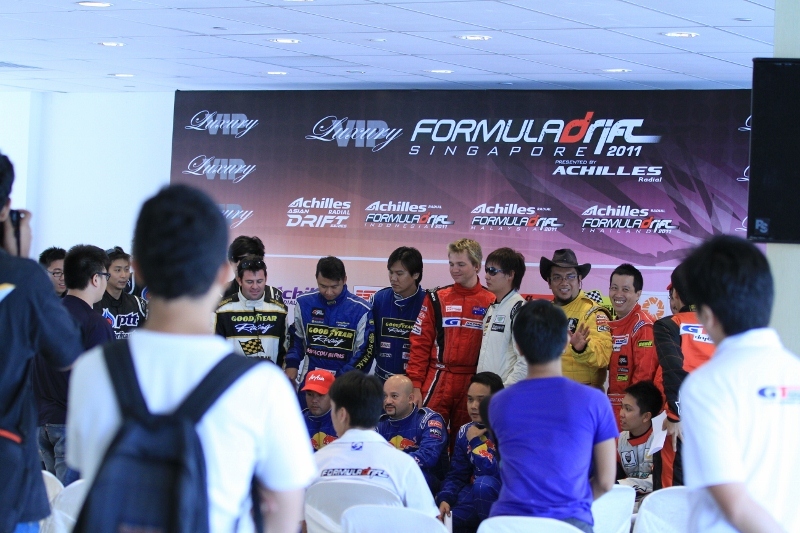 It was really fun to be a part of this group of drivers from all over the world, who were all really excited about the event! 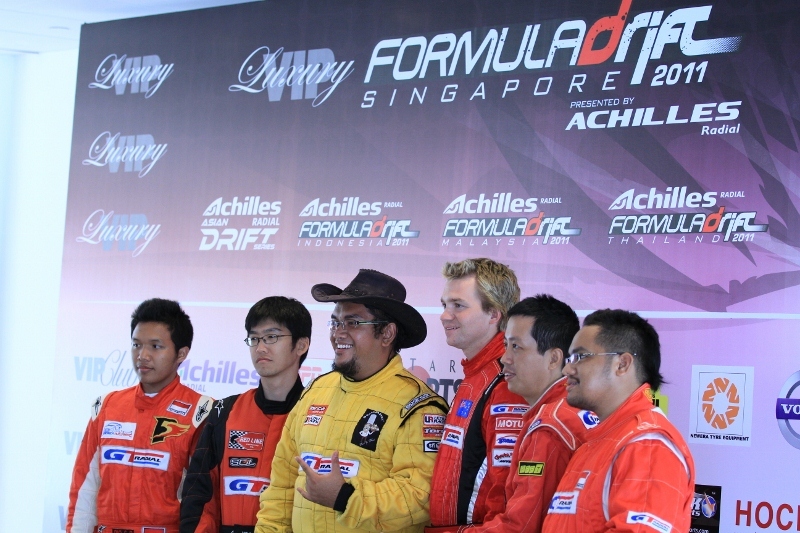 We also took the opportunity to take a team photo in front of the Formula D back drop. Afterwords we quick team meeting in the pit before going home for a good nights sleep. I think I was ‘putting my hands together’ for all the people that had helped us get to this amazing event. 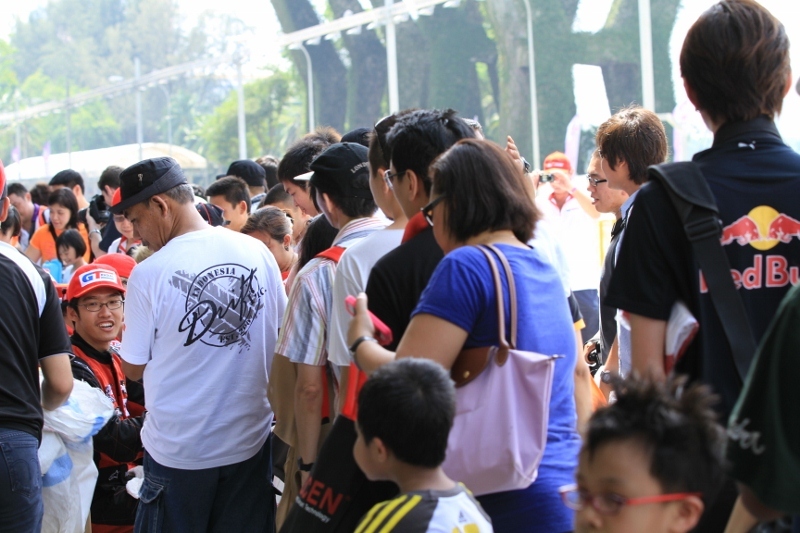 One of the things that was really amazing for me was the autograph sessions. I couldn’t believe that so many people wanted our autograph! 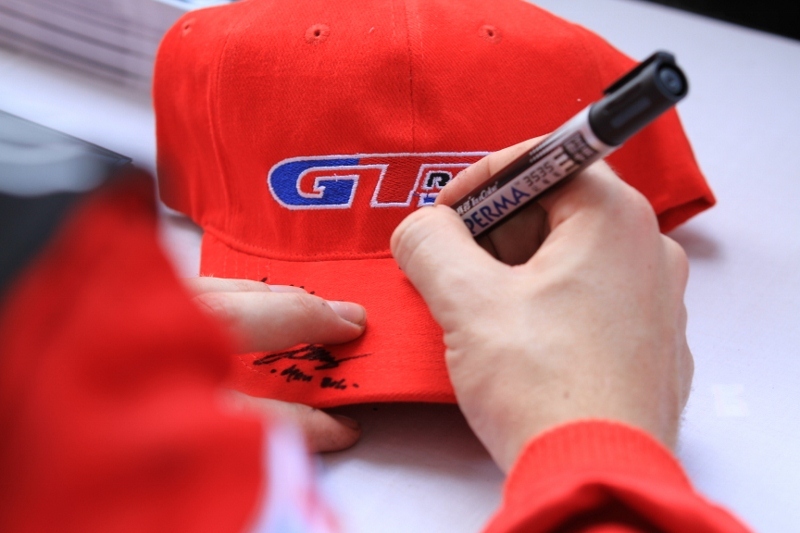 The team really enjoyed it, and GT Radial had plenty of things to sign and give to the fans! Another new experience for me was interviews. 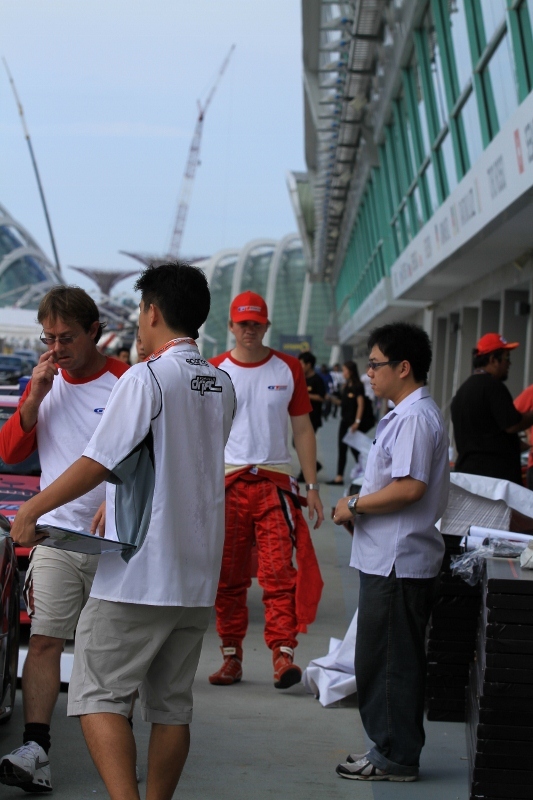 There were various website representitives and magazine crews asking the drivers for interviews. One crew was FederationD.com, they were always checking in, so I’m looking forward to seeing their video when they release it. 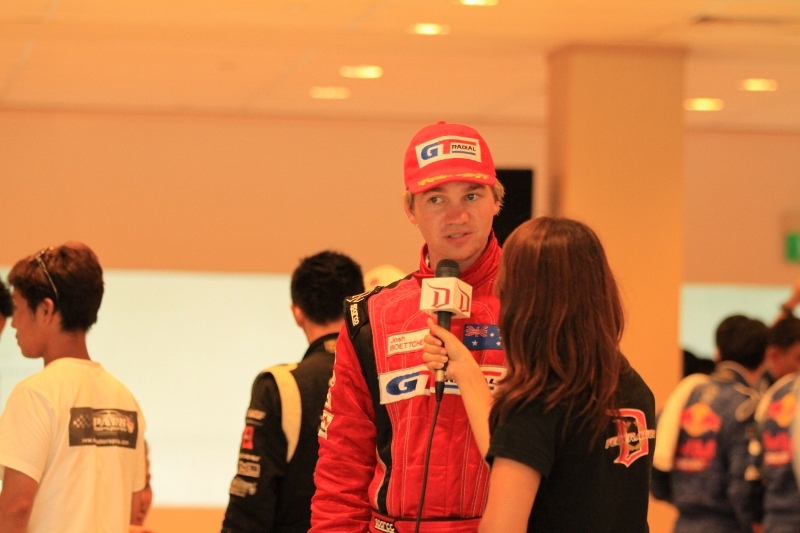 I also did a magazine interview straight after the event with Wheels Asia magazine, that article should be out very soon, and GT Radial will be sending me a copy, so I’ll put up some pics of that when I see it. How cool is this backdrop! There are so many crazy buildings in Singapore, especially around the Marina area. This was just before my first qualifying run, as you can see by the umbrellas in the background and drops on the car, it was in the wet. Gav was giving me the ‘you’ve done this before, mate’ talk. He was a huge part of keeping my nerves in check for the whole weekend. And the last shot I’ll leave you with is watching my car drive out of the venue to where the truck would pick it up. 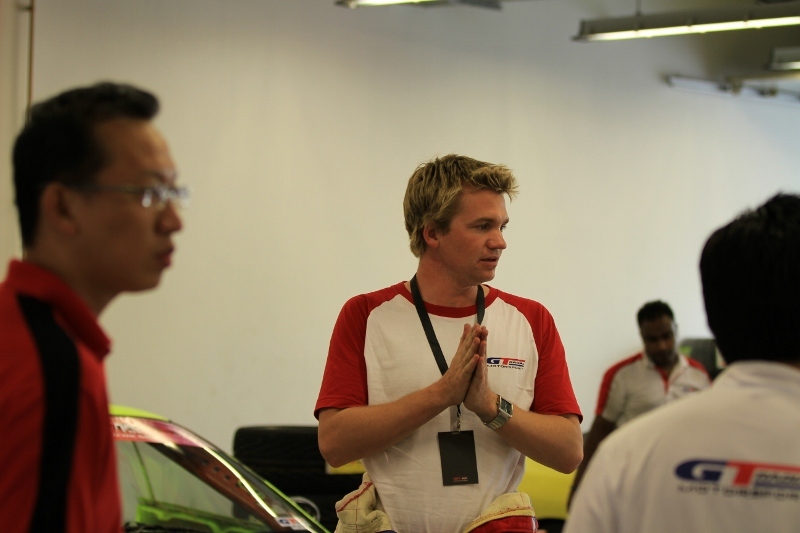 So there you have it, a quick look behind the scenes at Formula Drift Singapore. My next event is the 4th round of the Australian Pro Tour, coming up on Saturday the 16th of July at Parklands on the Gold Coast. And there’s a really busy few weeks coming up after that as well, but more on that soon.